If you want to have more battles, Mutant Enderman mod a little help you with this. 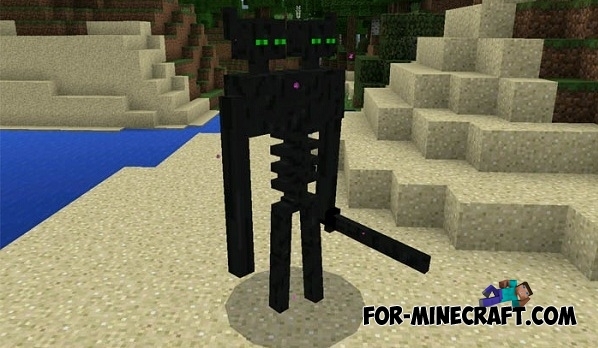 By installing it normal Enderman become a more powerful two-headed creature. Mod is quite simple and only changes the Enderman. Features of the new mob are as follows: Health increased by 5 times, damage increased by 2 times, the teleport is not possible. Fast Teleport mod for Minecraft PE 0.15Fast Teleport mod will allow you to teleport to any distance with the help of several special blocks. Mob Battles for Minecraft Pocket Edition 0.10.5This is a new addon for Minecraft PE, which adds to the game the opportunity to fight monsters with each other. For example, zombie vs zombie, etc.